Top Picks is some of my most viewed posts so I'm back with a post that has actually been requested quite a few times... My must have treatments for anyone with dry, damaged or coloured hair. This may come as a complete shock but I'm not a natural blonde, I know I know, it's shocking right?! I've been bleaching my hair ever since I was 17 *does maths* yes for 16 years. I've also been straightening my hair for the same amount of time. My hair has been through a lot! I never used to look after it and it reached a stage where my hair would just snap off and wouldn't grow at all. However I still didn't look after my hair. Fast forward a few years and I now have to look after my hair, I understand the importance of it more so now, and I also work for a brand that is all about having a good hair day! It's fair to say I've tried hundreds of products meant for damaged hair and I now no longer use anything that can be purchased from Boots or Superdrugs, as they honestly do not do anything aside from put a film of silicone over my hair and make me think it's doing something when it's really not! These are the products that I have noticed a visible change in my hair, a little more expensive yes, BUT they last longer as the products are more concentrated and these actual do DO something for my hair! Lush Retread Hair Conditioner. 245g for £10.75 Now I reviewed Lush Retread just over a month ago and you can check out my review just HERE This is now my go to conditioner since discovering it just over 2 months ago. Every single ingredient in this is aimed at treating damaged hair and adding lot's of moisture into it too. I have noticed such a change since using this. I think this is a must have conditioner for anyone who's hair is in need of some recovery! Redken All Soft Heavy Cream. 250ml. £21.25 Another product I have reviewed just HERE This is a rich deep conditioning treatment that I always have a spare one of. I used to use this every time I washed my hair but now I'll use it just once a month for an added boost of moisture. This also contains protein too, so it's great for repairing damaged hair. It also contains amino acids which help produce more hair fibres and encourages your hair to grow. My hair feels so smooth and soft after using this. Philip Kingsley Elasticizer Extreme. 150ml. £29.50 This is a must have for anyone who has dry or damaged hair. A pre shampoo treatment where you wet your hair and then apply a generous amount and massage it in to your hair. Then pop a plastic cap (one is included in this size) and leave on your hair for 15 minutes to an hour (or more) you then simply wash this out and shampoo and condition as you would normally do. Now I'm not going to lie, this is amazing! My hair felt stronger and fuller after the first use, after several uses my hair just felt completely different! Elastizer helps to improve the suppleness of your hair, elasticity, bounce and shine. It's just amazing! I bought the extreme version as it was on offer but next time I'll buy the standard version as my hair no longer needs the extreme version! I was using this with every wash but now use this every three/four washes due to the improvement of my hair. Redken Extreme Cat Protein Treatment. 150ml. £17.30 I'll be honest I don't use this very often any more due to the improvement in my hair but this protein treatment is a must have for anyone with severely damaged hair. You apply this after you have shampooed your hair, leave it for around about 5 minutes and then wash it off and condition as normal. We all know that we need to add protein to your hair to help strengthen and repair it, which as a result will stop hair from snapping off and aid it into growing. Using too much protein can have the opposite effect, it can make it dry and brittle and then snap off, so I'd recommend using this just once a week until your hair has improved, then use it maybe once a month to just give your hair that added protein boost. The ingredients penetrate deep into the core of your hair which helps to build the internal structure of your hairs strength and repair any damaged hair you have. I love this and honestly can't recommend this enough. This will also last you ages too as you should only use a little. Cloud Nine Magical Remedy* I was sent the magical remedy to try and review earlier in the summer, which you can read the review just HERE I raved about how amazing my hair felt after using this cream and I still stand by my original review. You can use this in many ways but I prefer to use this after I've washed my hair as a leave in conditioner. I noticed a big change with the smoothness and fullness of my hair after using this and continued to feel and see a change up until I used it all up. It is amazing but what is annoying is that it only comes as part of a set, the other product is the heat defence spray, which I'm already happy with what I currently use so it doesn't look like I'll repurchase this until it comes out on it's own. However, if you're in the market for a great treatment and heat defence spray then I'd pick this up. Redken All Soft Argan-6 Oil. 90ml. 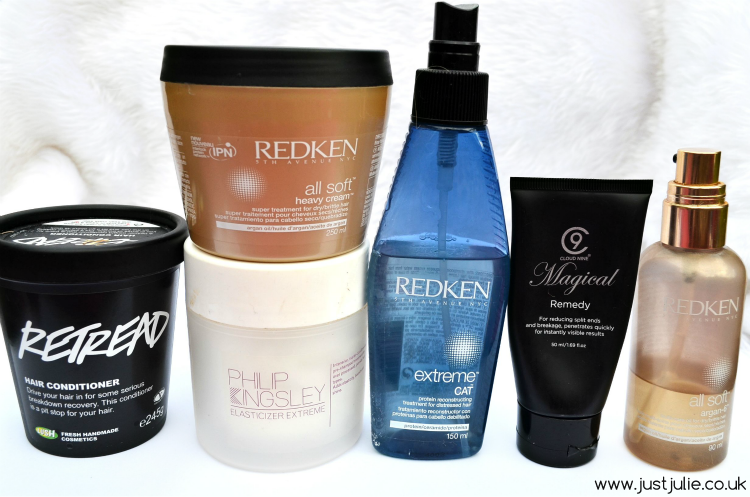 £26.00 I've just noticed that this is the third Redken product that I've mentioned here, I promise I'm not being sponsored!!! I've shared my love of this before just HERE and also my love for Argan Oil in general. It's a must have product for my hair routine and for anyone concerned with their hair. The Redken All Soft Argan-6 oil is a multi-use product. Apply it on dry hair over night, apply it after washing your hair or after you've styled it. Each way will give you amazing results, but applying it before washing your hair and leaving it over night or for an hour or two will give the best results as it allows the ingredients to penetrate deeper, and believe me you notice the difference. The ingredients help to deeply condition and nourish dry brittle hair. It also has a keratin complex which helps to restore your hairs natural protein. Sounds amazing right? Well it is! 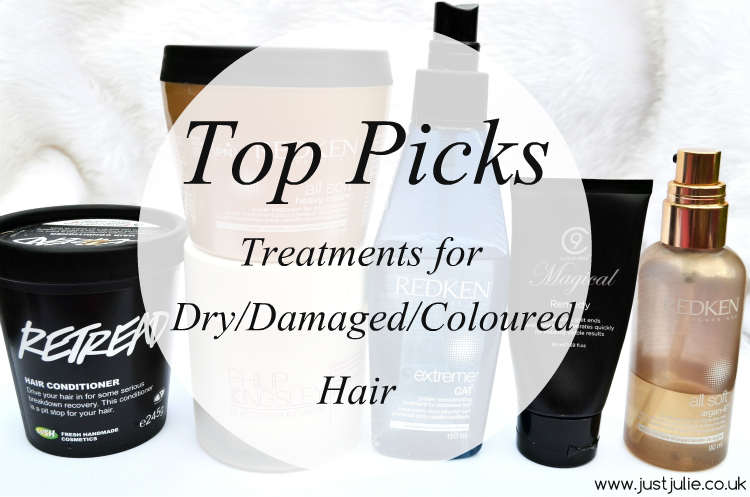 So those are my top picks for anyone who has dry, damaged or coloured hair. I promise all of these will make a huge difference. I know these cost a little more than what you can get from Boots but I promise you there is a reason why. The ingredients are more concentrated so you need only use a small amount, which means they will last you a lot longer, also the ingredients work a lot deeper and don't just coat your hair. I couldn't pick what one of these is my favourite as they're all amazing and have all helped improve the condition of my hair. I also want to give a quick nod to Ojon Restorative Hair Treatment which is another pre-wash treatment which just leaves my hair feeling amazing! I don't have any of this left, which is why I didn't include it above but believe me this is amazing too and so worth picking up! Have you tried any of these treatments before? What is your favourite hair treatment?